Phang Nga Bay James Bond Khai island. If you are looking to get out of Phuket for the day and if you have already been to Phi Phi and surrounding islands, this trip is a great option for you. Phang Nga Bay is amazing and must be seen. Phang Nga Bay has a few rivers running in to it, so although the water is clean, it is merky and there is no snorkeling on these trips. They make up for that with other fun activities like canoeing and kayaking in various caves which is awesome. This trip also includes a tasty buffet lunch on Panyee Island, also known (The Floating Muslim Village) where you also get time to have a walk around and possibly do some shopping and take pictures. Beautiful scenery and islands as well as lovely mangrove forests to check out. An amazing day. Book now for Phang Nga Bay James Bond Khai island. 07.00-08.00 Pick up from hotel and transfer to Royal Phuket Marina Pier. 08.30 Arrive at the pier, check in. Serve you with variety drinks. 09.30 Depart to Phang Nga Bay by speedboat. 10.00 Arrive at Panak Island, sightseeing wonderful stalactite, cave and lagoon. 11.30 Sightseeing great mangrove forest viewing Puddle Rock and Ancient paintings. Enjoy with quality lunch buffet on Panyee Island. Depart from Panyee Island to enjoy canoeing among mangrove forest at Hong Island. 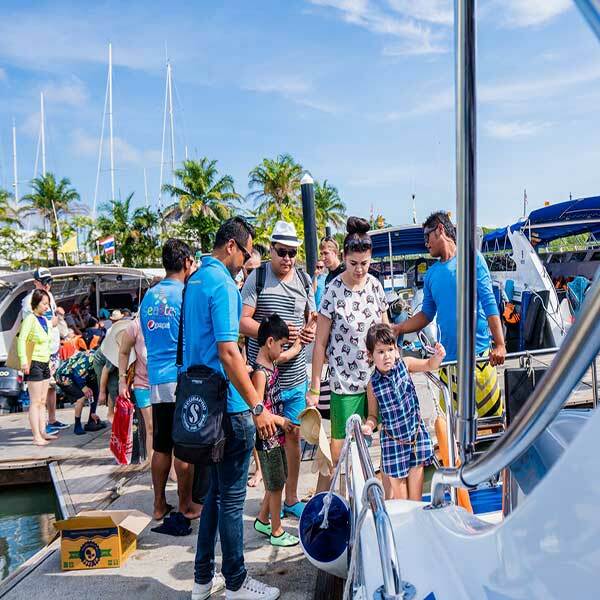 Arrive at Royal Phuket Marina Pier, then back to your hotel safely. Deluxe Phi Phi Maya Bamboo Island. This is an amazing day or snorkeling, swimming, island hopping and relaxing on white sandy beaches. Come and join us and book in for this and other amazing island trips that we have to offer. Naka Noi island sunset dinner. This is the perfect trip for you if you don’t want to spend too much time on a speed boat traveling to your destination. Only 5 to 10 mins travel time and you can enjoy a whole range of fun things to do on this tropical paradise. Sunrise trip James Bond Island. 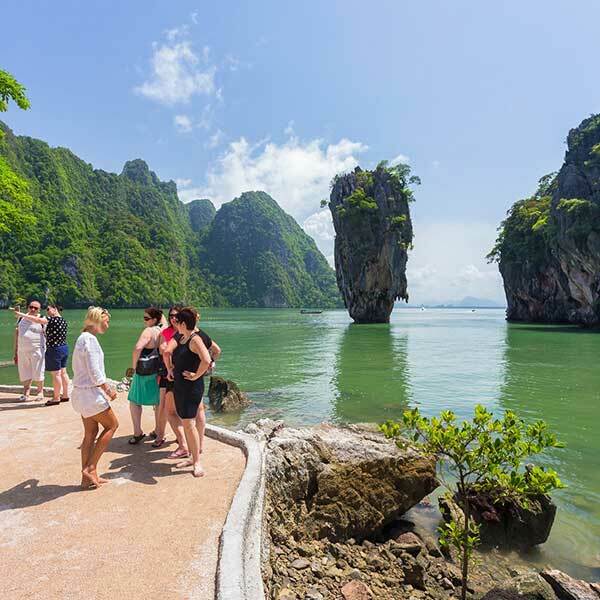 This amazing trip starting early in the morning will get you to James Bond island and these other island destinations before all the other crowds arrive and gone by the time they get there. Premium James Bond island cruise. Travel in style and have a memorable day sightseeing around Phang Nga Bay with this Premium Tour, an awesome way to travel the islands. Hong island floating Muslim Village. Do a bit of kayaking in the caves, visit the Floating Muslim Village, leaning Rock and Naka Island. 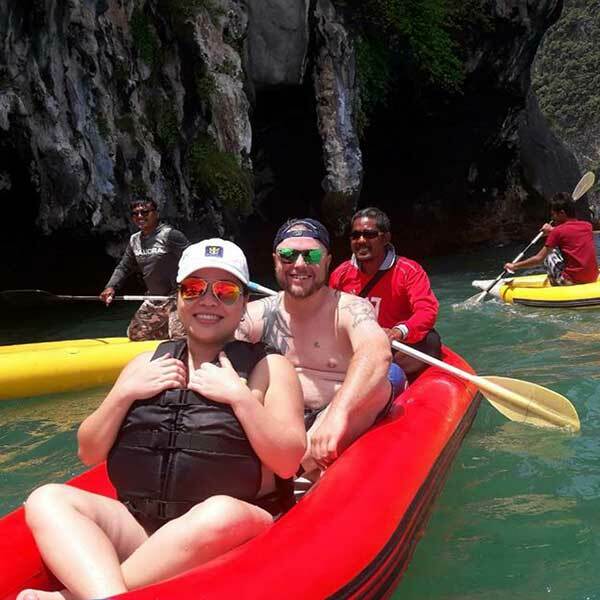 This tour to Phang Nga Bay is a great alternative to Phi Phi and surrounding islands if you are looking for something a bit different. John Grays Hong by Starlight Big boat. A truly amazing day in Phang Nga Bay, canoeing in and out of different caves, very relaxing, slow paced, amazing for all ages. Making your Kratong at the end of the day is a lovey experience.